I recently had the honor of partnering with the Make-A-Wish Foundation and Gracie’s Room to design a bedroom for a young 14-year-old girl named Rose who was diagnosed with a genetic heart condition. It was a phenomenal experience that definitely tops the list of my most memorable design projects. So, today, I’m giving you a behind-the-scenes look at this incredibly special makeover – read on to meet Rose, the members of our design team, and to see the big design reveal. I hope you enjoy. A 14-year-old girl from Isanti, MN, Rose was just like any other kid her age when she was growing up. She adored spending time with her friends, was an active dancer and soccer player, and loved to experience life to the fullest – including grabbing coffee at her favorite local spots with her mom. At 11 years old, though, her life changed. After a few unexpected fainting spells, doctors diagnosed her with a genetic heart condition. In a nutshell, exercise can be fatal, causing her heart to stop out of nowhere. For a young girl who has always loved high energy activity, this was a crushing reality to face. I partnered with both Make-A-Wish and Gracie’s Room on this project and can’t give them enough praise. So, here’s a bit about each of the organizations and the wonderful work they do! Ready for the design reveal?! More than anything, Rose wanted a bold and boho-modern bedroom with plenty of black and white, and a dash of glam built in. 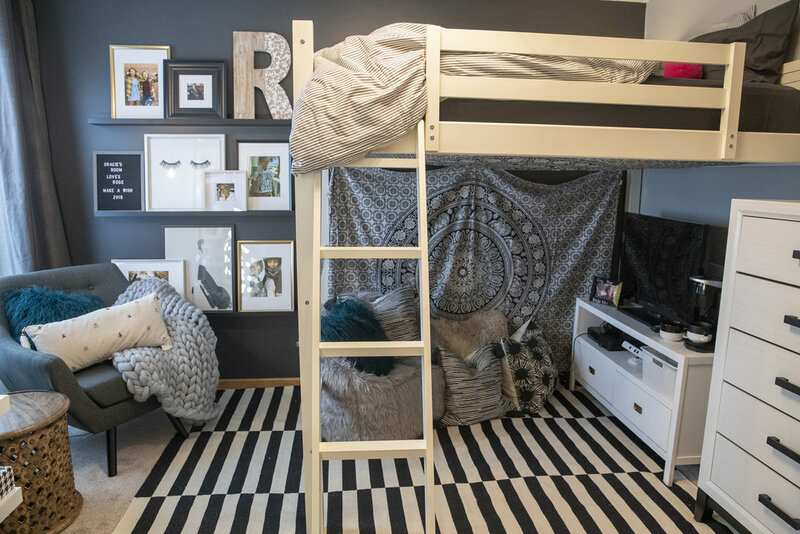 So, we started with an accent wall in a dramatic color (Benjamin Moore’s Cheating Heart), set up her bright white loft bed in front of it for ultra-contrast, then added in layers of black and white patterns and textures to give it a dash of fun and personality. To top it all off, we incorporated a photo wall, a bright vanity station, several comfy lounge spots, and a glitzy gold and modern starburst light fixture. The result? A chic space where she felt right at home – free to get creative and continue to pursue her favorite things.